The shape and proportions of this bird look good for a diurnal bird of prey. The wings are too long for an accipiter and too round for a falcon, so we can conclude that this is a buteo or buteo-like raptor. Vultures can be eliminated by the white rump and lower flanks. 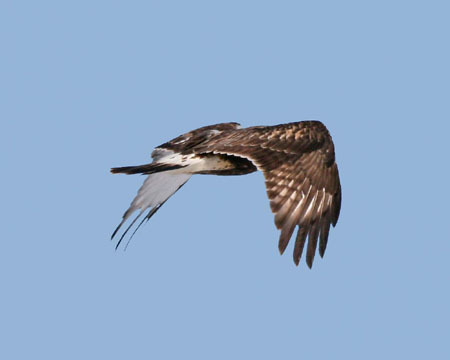 The dark upperparts might recall an Osprey but an Osprey would show a banded tail and some barring on the underside of the wings. The tail of our candidate is mostly dark and the underside of the left wing is unmarked. The white rump might suggest a Northern Harrier but the wings of our bird look a little to broad for that species, and the tail doesn't look long enough. Eagles are huge, ponderous birds with longer wings than our quiz bird. Also, returning to a mark mentioned before, eagles wouldn't show such extensive white on the underside of their primaries. Six of the "broad-winged" hawks known as buteos occur or have occurred in Illinois. Swainson's Hawk has pointed wings in flight and lacks the white primary panel of our quiz bird. A Red-tailed Hawk would have either a red tail (adults) or a brownish tail with fine banding (immatures). Also, the white on the primaries of an immature Red-tailed crosses onto and includes the primary coverts. Note that the primary coverts of our quiz bird are dark. A Broad-winged Hawk would show a banded tail and more pointed wings. Red-shouldered Hawk would also have a banded tail and a white or tawny crescent restricted to the outer primaries. Ferruginous Hawk also shows a white wing panel on the primaries like our quiz bird, but enough of the underparts of our bird are visible to see a black belly. The black belly contrasting with the rest of the underparts and the white panel on the primaries look good for a Rough-legged Hawk, which is what this bird is. This Rough-legged Hawk was photographed by Vic Berardi on January 20, 2007 at Bong Recreation Area in Wisconsin.